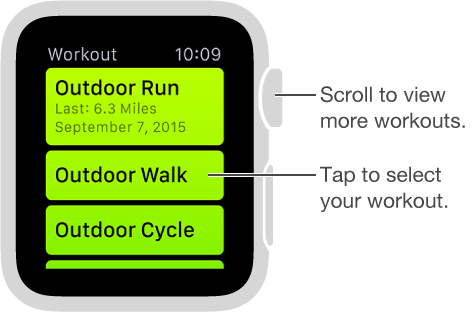 The Workout app on Apple Watch gives you tools to manage your individual workout sessions. It lets you set specific goals, such as time, distance, or calories, then tracks your progress, nudges you along the way, and summarizes your results. You can use the Activity app on iPhone to review your complete workout history. See Keep your data accurate for information on how Apple Watch is calibrated. Start a workout. Open Workout , then tap the workout type you’re going for. As you use the app and choose workouts, the order of workouts will reflect your preferences. 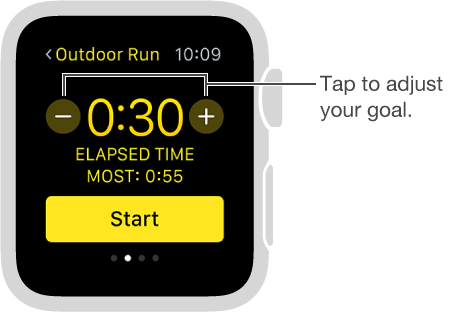 On the goal screen, swipe left and right to choose a calorie, time, or distance goal (or no goal), then turn the Digital Crown or tap + / – to set. When you’re ready to go, tap Start. If you’re measuring calories or time, you can leave iPhone behind and exercise with just Apple Watch. But for the most accurate distance measurements outdoors, take iPhone along. 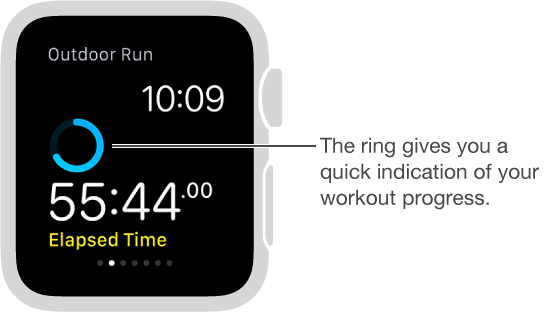 Note: Apple Watch estimates calorie burn differently for indoor and outdoor workouts, so be sure to choose correctly. For indoor workouts, Apple Watch relies mainly on your heart rate readings. For outdoor workouts, Apple Watch also uses speed and distance information from iPhone (which has GPS). Check your progress. Check the completion ring during your workout for a quick progress update. Swipe on the lower half of the screen to review elapsed time, average pace, distance covered, calories consumed, and heart rate. Instead of viewing the progress rings, you can choose to see your distance, calorie, or time values numerically. Open the Apple Watch app on iPhone, tap My Watch, then turn on Workout > Show Goal Metric. Pause and resume. To pause the workout at any time, firmly press the display, then tap Pause. To continue, firmly press the display again, then tap Resume. Avoid accidental taps. If the exercise you’re doing or the gear you’re wearing causes accidental taps on Apple Watch, lock the screen so your workout record isn’t interrupted. Firmly press the display anytime during a workout, then tap Lock. Conserve power during a long workout. You can save power by disabling the heart rate sensor during long walking and running workouts. Your calorie burn estimates might not be as accurate. Open the Apple Watch app on iPhone, tap My Watch, tap Workout, then turn on Power Saving Mode. End the workout. When you reach your goal, you’ll hear a tone. If you’re feeling good and want to continue, go ahead—Apple Watch continues to collect data until you tell it to stop. When you’re ready, firmly press the display, then tap End. Turn the Digital Crown to scroll through the results summary, then tap Save or Discard at the bottom. Review your workout history. Open the Activity app on iPhone, then tap a date. Scroll down to see your workouts listed below the Move/Stand/Exercise summaries. Swipe left on a workout to see details for it.